In a small shop on University Avenue in Palo Alto, mobile payments vet Will Graylin proudly points out the point-of-sale (POS) system sitting next to the register. "This is a 13-year-old Hypercom," Will explains, emphasizing its age and the lack of modern mobile payment options. Then, he does something we haven't seen before: he puts his iPhone next to the mag-stripe reader, taps a button on his screen and the transaction gets processed as if he'd physically swiped his card. Companies like Google, Isis and MasterCard (among others) are competing with each other to see who can establish an NFC-based mobile payments standard and build a strong enough ecosystem to support it, but Will -- along with co-founder George Wallner -- is approaching the highly competitive and nascent smartphone commerce market from an entirely new direction. 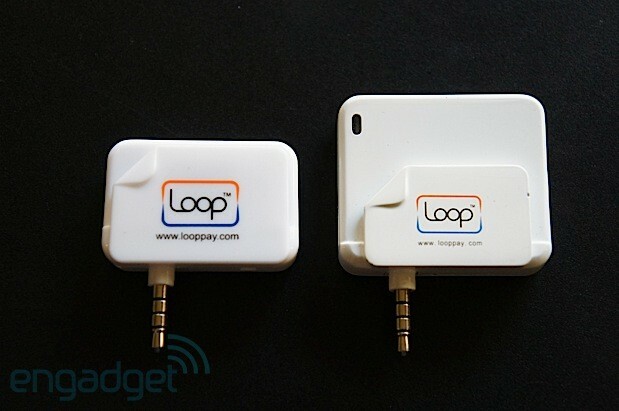 The duo's new company, known as Loop, is debuting a new platform that will let you use your phone to make payments on nearly 90 percent of all POS systems in the country, even if they don't have any tech embedded inside that's capable of accepting contactless payments. Continue with us below to see a hands-on gallery and a deeper explanation of what exactly makes this possible. The Loop Fob -- a $34 device that plugs into your iPhone or Android handset through its 3.5mm headphone jack -- is one of the products the company is launching on Kickstarter today (with the first shipments expected closer to the end of the year). It's roughly the size of a matchbook, features a mag-stripe reader slot and looks quite similar to a Square. The Fob is capable of encrypting and storing your credit or gift card information and transmitting it to most typical POS systems. When setting up the Fob, you'll be prompted to download a LoopWallet app on your phone. 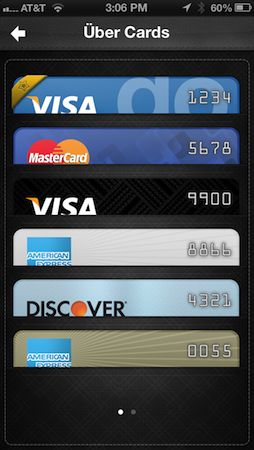 The app is responsible for managing all of your credit and gift cards, loyalty and membership cards and even your ID. (The app can't replace your physical ID in case you need it for official purposes, but it can be handy for a quick reference.) This app, which is protected by a four-digit PIN, acts as your interface with the Fob just in case you want to change your personal information, add cards or switch preferences. Since the Fob holds your payment information, it doesn't need to be connected to your phone in order to make payments -- it just pays using whatever card you've selected in the app as your default payment method. However, if you want to pay with a different card, you'll need to make sure the Fob is connected to your phone; then, when it's time for the transaction to take place, use the app to choose which card you want to use and tap on it while holding the transmitter next to the register's mag-stripe reader. 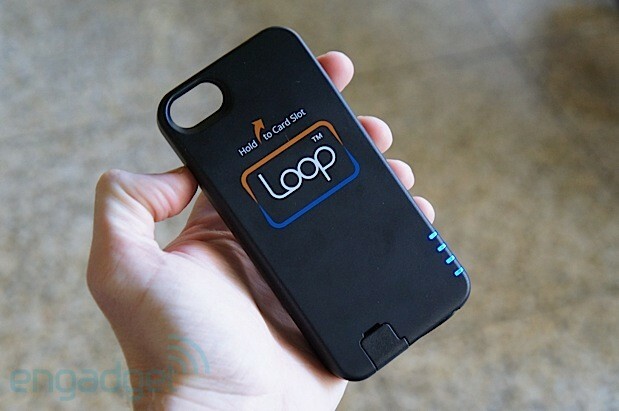 The Fob is just one part of Loop's product portfolio. The company will also offer a $99 iPhone 5 / 5s ChargeCase (shown below) that's just under 6mm thick and combines a built-in transmitter with a full-on external battery; it's not exactly the thinnest case out there, but it'll come in handy for iPhone users who don't want to carry around the Fob wherever they go. Since the case itself doesn't feature a card reader (which you use to store any of your cards), the Chargecase package includes a read-only dongle that's a bit smaller than the regular Fob. It's difficult to explain how the Fob can transmit your information to any ol' POS without diving into a course in electrical engineering, but the technique -- which Loop refers to as Magnetic Secure Transmission (MST) -- involves the same technology currently used in inductive charging. In essence, the Loop transmitter can manipulate the magnetic field enough to transmit the mag-stripe data from your cards, causing the POS to think it just registered a normal card swipe. What kind of security measures have been put into place? On the payment side, the phone must be less than four centimeters away from the mag-stripe reader, and the encrypted information only gets transmitted during the brief few seconds of the transaction. No sensitive data is stored on Loop's servers, and all of your card information is protected by a four-digit PIN, which is very similar to Isis and Google Wallet's apps. This is after setting up a special Loop account, too, so if someone steals your Fob and tries to use it on their own phone, they'd need access to your user name and password first. Will's team claims that Loop works on roughly 92 percent of all POS systems in the country -- this includes devices like Square and PayPal Here, he tells me -- but why isn't it a full 100 percent? There are two types of systems Loop simply won't work on: the dip-style card slots that you find at gas stations and ATMs, and a special two-sided mag-stripe reader that Will says is only found in a small number of older machines. However, of the six or seven stores we visited in Palo Alto, each of which used different types of systems, Will had no problem using the virtual cards on his ChargeCase instead of having to pull out his wallet. Loop has a clever take on the contactless payment industry, but it doesn't have an easy journey ahead. Not only does it have to sell the tech-savvy early adopter at launch, it will also need to persuade skeptical customers to give mobile payments a try, while soothing potential security and privacy concerns at the same time. The ChargeCase may feel too bulky for some, and anyone who uses a different phone (or prefers another case) will need to carry the Fob around with them as an extra accessory. Even though Loop is launching its Kickstarter campaign today, it isn't putting all of its eggs in one basket: the company's actively engaged in talks with smartphone OEMs to embed its MST tech into handsets next year, though nothing is confirmed at this time, and Will couldn't go into more detail on which companies have expressed interest. Will and George are unsurprisingly optimistic that these new offerings will halt services like Google Wallet and Isis in their tracks, mainly because of its ubiquitous platform. "The funny thing is," Will tells me as he buys a drink at Starbucks, "my gift card can be picked up by more Starbucks stores [with Loop] than if I were to use their own official app, since not all of their stores have the right equipment installed." That isn't a guarantee for success by any means, but at least it's a noteworthy accomplishment. 6-10 at the Aria Hotel in Las Vegas. Loop will be located at Launchpad Kiosk 68.
customers' mobile device, without heavy integration or cost. Merchants and issuersto promote and interact with their customers using LoopPromote. smartphones. "We are delighted to be introducing Loop™, the most accepted mobile wallet solution in the world, at Money2020," said Will Graylin, founder and CEO of Loop. "We look forward to presenting our cool new platform at this event."